When it comes to running, we often work hard on our form, drills, intervals, and everything and anything to do with our training. However, we only run perhaps an hour or two a day. It’s what we do during those other 22 or 23 hours that really matters. You see, what you do outside of training directly affects your body and makes permanent habits that are very hard to override in training. 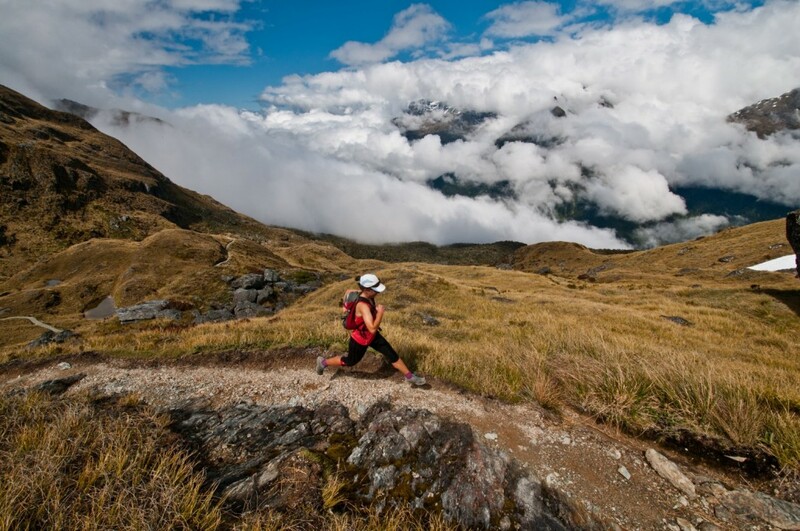 So what you do outside of running becomes exceptionally important to making you a stronger, more efficient, injury-resistant runner. Viewed another way, this is a fantastic opportunity to improve your running, without having to work any harder, and if you’re competing, a HUGE way to get a leg up on the competition, because you can use those extra 22 hours a day to give yourself a tremendous leg up. Everything from diet, how you sit, how you stand, how you walk, eat, sleep, and…well, everything can improve your running. But one of the most important pieces is how you stand and walk. In our relaxed modern culture, we place less emphasis in perfecting our posture, but our bodies and thereby running are suffering as a result. 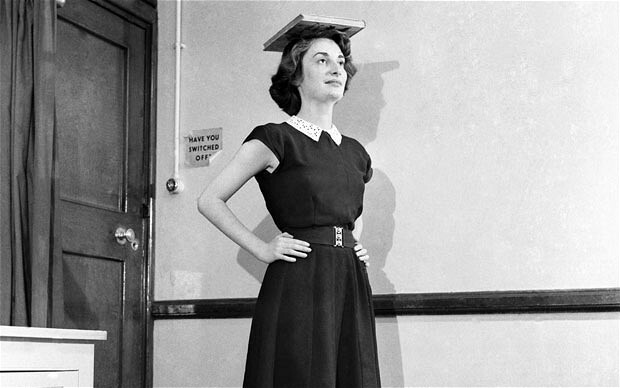 Learning to balance a book on your head might be a great activity after all. I hate to say this, but your mom was right. We need to stop slouching and stand up straight and proud. Poor posture does more than just wreak long-term havoc your the skeletal system, but dramatically affects your performance. 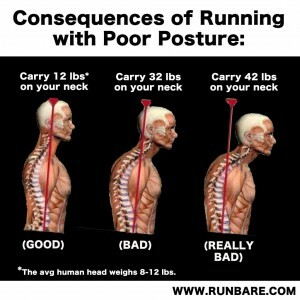 Poor posture closes the lungs, making it harder to breath deep and harder to stay relaxed when we run. It brings the shoulders in and rolls them down, both inefficient and perhaps more importantly, off-balanced. Because as our shoulders roll forward, they drag everything forward, putting more weight on our joints and on our feet. And then there’s the head. You should be able to run an imaginary silvery string from the center-point of your feet, straight up through the mid-line of your body, and out through the center of your head. This helps keep your weight perfectly balanced, which you can use to carry yourself forward. When you run, if you lean forward just slightly, chest and chin proud (pushing ahead with chest and chin) you enter a state of a controlled fall, put one leg out in front of you, then the next, and then…voila, you’re in a gravity assisted run, with almost no effort at all. How much weight do you want to carry on your neck? But, if you’re head is leaning out in front of you, it doesn’t work quite this way. The average human head weighs between 8 and 12 pounds if it’s straight on top of you. Lean forward slightly and you can more than double that weight on your body (it’s all about levers). Lean forward just a bit more (typical with our poor posture these days) and it more than TRIPLES the weight. Now this additional weight doesn’t give you a gravity assist as you run. 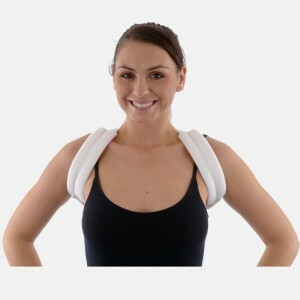 Instead it pulls you down, pointing huge excess stress on your back, neck, shoulders, hamstrings, hips, knees and feet. And it makes you incredibly inefficient. Mindful Posture 24/7: Stand tall. Sit tall. Walk tall. Make every motion you do throughout the day a mindful tall exercise. Keep your shoulders back, your chest and chin proud, and sit and stand like the best runners you can think of. Picture the Kenyan’s for instance, who are always leading with chest and chin. Can you picture their best runners curled over at the computer, hunching forward with their shoulders or curled up in a car. No? That’s because they sit, stand, and walk, just like they run. And now it’s your turn too. If you’re having trouble sitting tall. I had difficulty with this myself too. Look at your desk chair, and scoot your derriere toward the front. This forces you to pivot on the front of your sit bones, making you sit tall. Move yourself away from your desk, this also helps you sit tall. And last, but not least, if all else fails, consider a figure eight harness to help you reposition your upper body. 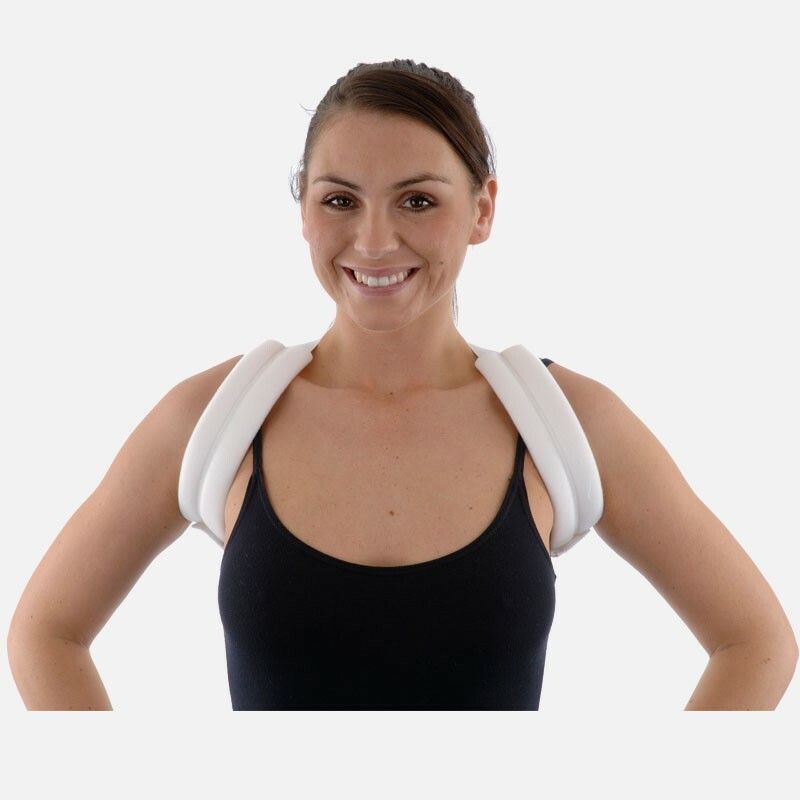 It’s like wearing braces for your teeth, but for your shoulders and back, helping you develop perfect posture. Great posture won’t just help you run. It’ll give you greater confidence in all that you do. And it’s funny, the taller you stand, the more respect you earn from the people around you. There’s also a mindful benefit to it. The taller you stand, the more focused you are on your posture. The taller you stand, the more balanced you feel, the more reassured, quiet of mind, and powerful you feel, in all that you do. Give yourself reminders to keep up your mindful posture…pop up windows, sticky-notes, whatever it takes…just don’t ask a spouse, you don’t want that kind of heat! Hi Michael, You’ll hate me for this statement but…posture is supposed to be 100% unconscious! Yes that means NOT MINDFUL. Where in the world did I get that idea? From the perfect models of great posture…children. They NEVER think about their posture – it just is. Thinking about posture is not the goal and has very negative effects because it stops natural movement from happening. Perfect running form might look like someone is being mindful of their posture, but in reality they are not (or if they are it LOOKS like they have perfect running form but do not in reality). Yes I understand where you and much of the world are coming from – you look around and notice everyone has less than ideal posture, movement patterns, sitting posture, and running form. You think – I can help them with that. I can teach them how they are supposed to hold themselves and move themselves and they look better – great. BUT and it’s a big BUT, they are not actually moving that much better – just different. Looks are deceiving. 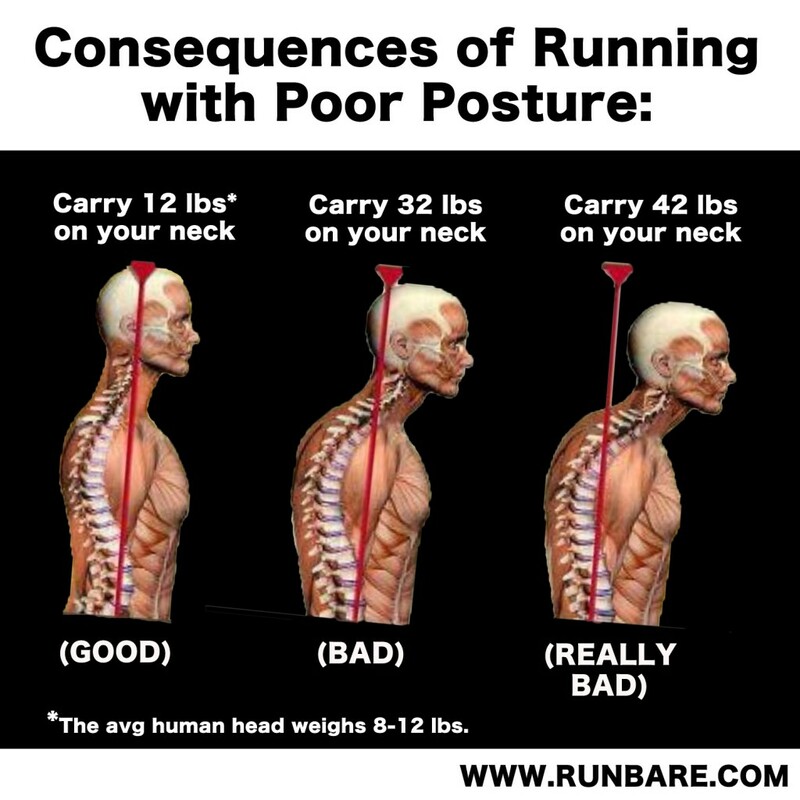 Think about it: many people you know that look like they have great posture and running form still have lots of pain and injuries. Why? They are not flawed. It’s not genetic. It’s not age. It’s not bad luck. It’s not even overtraining. It’s that they are being mindful (conscious) in one way or another about they posture and form which looks better but is not fully natural and functional. This improper movement pattern is creating stress and wear and tear in their bodies just as the other runners with obvious poor running form and posture. People with true perfect running form suffer no pain or injuries and they ARE NOT BEING MINDFUL of their posture or running form – it’s natural just like when they were kids. It is possible to regain perfect natural posture, movement, and running form. But the focus must be on the muscles of the body not the mind. Teach the muscles how to position the joints correctly and the mind doesn’t have to do it. It is free and so is the body to move naturally again. I don’t know if you are familiar with my ideas on what separates humans from all other animals on earth? We are the only animal on earth the is designed to move through the world leading with our hearts (our heart posturally is designed to be the most forward part of our body, not our head as most people’s posture reflects today) and not our heads (in all other animals their head is the most forward part of their bodies). They think their way through life, we feel/love our way through life. But only if our posture allows us to. You bring up several excellent points. In a perfect world, we would all still have perfect posture. However, do to bad habits, poor equipment, or just our modern lifestyle, we’ve forgotten how to do all of the great things that make us human beings. So the first step to returning to this state of beautiful health and strength is to regain awareness. First, awareness of what we’re doing, period. Then awareness of the new process or procedure (such as standing tall). Then we work to hone this skill and develop it to perfection. And then, and only then, can we work (ironic) to let it go and let it become without mind, or what we call mindless. We call this going from Mindlessness to Mindfulness to Mindlessness back again. The thing is, there’s never an end to the cycle, as we’re continuously improving, becoming self aware, and working to fine tune. It’s like defending a thesis, or preparing for a race, we always find something else to improve upon, particularly as we wake up and become more aware. I love what you’re saying about leading with our hearts, it’s beautiful, it’s perfect, and yes, it absolutely requires the “mind” to take a back seat. Be well, and sending love and blessings your way. Smile at a rainbow in Maui for my kids will you? Thanks. 1.) A 3-part Mindful Running video series.